Allied Paving Corporation will be on site to complete final paving at the intersection of Summer and Maple Street. 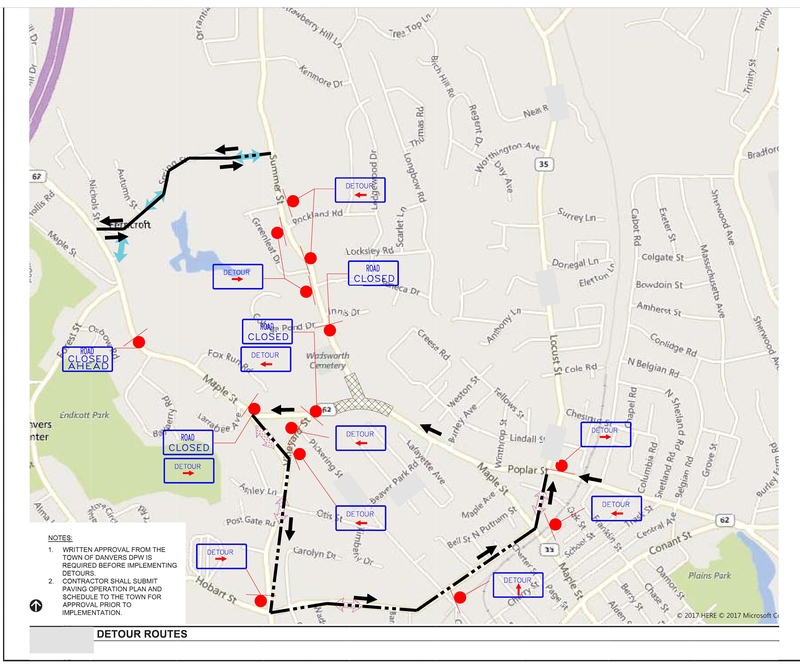 A traffic detour will be implemented by the Contractor, with assistance from the Danvers Police Department on Thursday, November 15 from 7:00am to 5:00pm, weather dependent. Maple Street EASTBOUND Traffic shall be detoured. Beginning at Pine Street, all eastbound traffic will follow the detour from Maple Street to Pine Street and a left onto Hobart Street. The detour will end at the intersection of Poplar Street at Locust Street. All WESTBOUND traffic on Maple Street will be allowed to flow freely. SUMMER STREET WILL BE CLOSED BETWEEN THE HOURS OF 8:00 AM AND 1:00 PM. Once road is reopened, all NORTHBOUND AND SOUTHBOUND traffic on Summer Street shall be directed by the detail officer stationed at the intersection of Maple and Summer Street. We ask that you allow extra time when traveling to and from your home to account for this construction, as you may be delayed by construction equipment working within the street. Thank you for your cooperation and assistance during the Maple Street at Summer Street Intersection Improvement Project. For more information, or should you have any questions or concerns regarding this work please contact the Engineering Division at 978-777-2668 ext. 3619 or by email at erichard@danversma.gov.